Swamimalai is a sylvan village, situated about five kilometers west of Kumbakonam on the banks of a tributary of river Cauvery. The temple is situated very close to the bus stand and the railway station is about two kilometers away. It is well connected to and surrounded by important places like Kumbakonam, Tiruvidaimarutur, Mayiladuthurai, Papanasam, Tanjavur etc. Swamimalai is fourth among the six padai veedu or sacred shrines dedicated to Lord Muruga. The presiding deity here expounded the meaning of the pranava mantra OM to his own Father Lord Siva Himself. Mythology says that saint Bhrugu before commencing an arduous tavam or penance, got the boon that anybody disturbing his mediation will forget all his knowledge. Such was the power of the penance that the sacred fire emanating from the head of the saint reached up to the heavens, and the frightened devas surrendered to Lord Siva praying for his grace. The Lord extinguished the sacred fire by covering the saint’s head by hand. With the saint’s penance thus disturbed the Lord became oblivious of all his knowledge and is said to have regained them by learning the Pranava mantra from Lord Muruga at this shrine. Once when Brahma, the lord of all creations was proceeding to Kailasa, the ever-playful child Lord Muruga asked him for the meaning of the Pranava OM. When Brahma admitted his ignorance, the Lord imprisoned him. With Brahma imprisoned, all creations came to a standstill and the devas prayed to Lord Siva to get Brahma released. When Muruga insisted that the imprisonment was a just punishment for the ignorance of Brahma, Lord Siva asked him whether he himself knew the meaning of the primordial Pranava OM. Lord Muruga said that he knew the meaning of OM and can expound it to the latter only if he can accept him as guru and listen to the exposition as a devoted disciple. 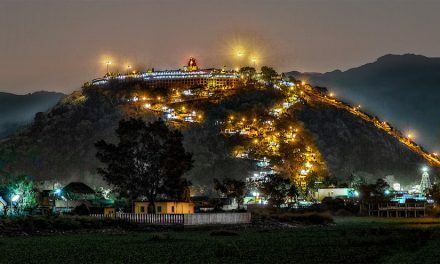 As Lord Siva acceded to the request of Lord Muruga and heard the exposition of OM as a disciple, the place came to be known as Swamimalai and the presiding deity as Swaminathan. The temple is built on an artificial hillock of about sixty feet height with sixty beautifully laid stone steps representing the Hindu cycle of sixty years – leading to the Lord . In the ground floor there are temples dedicated to Lord Sundareswarer and Goddesss Meenakshi. Hymns in praise of the presiding deity have been sung by saint Nakkeerar in Tirumurukatrupadai and by Saint Arunagirnathar in Tiruppukazh. Daily pujas to the deities are performed six times a day (six kalams). Usha Kalam, Kalasandhi and Uchikala poojas are performed in the forenoon and the afternoon poojas commencing from Sayaratchai and Rendam kalam are concluded with Arthajama pooja in the night. Pankuni Uttiram festival in March. The temple has an imposing golden chariot made of seven kilos of gold, 85 kilos of silver and other metals like copper, beautifully illuminated with electric bulbs. Devotees on payment of Rs. 1001 can take the deity in a procession in the golden charriot around the outer corridor. Devotees are offered a shawl, eversilver pot and a small box with the Lord’s prasadam. For the convenience of the pilgrims and devotees, 11 rooms, four cottages, two VIP cottages, one donor cottages, three marriage halls and one dining hall have been constructed and are let out at nominal rent ranging from Rs. 20/- to Rs. 100/- per day only. Among the sub-temples under the administration of the Swamimalai temple, the Sveta Vinayagar temple at Tiruvalanchuli is an important one. 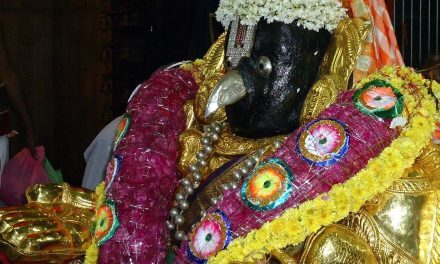 The presiding deity Lord Sadaimudinathar and Goddess Perianayaki have been sung by Tirugnanasambandar and Tirunavukkarasar in Tevaram. A unique feature of this temple is the Sveta Vinayagar or White Pillaiyar made of the sea foam formed at the time of churning of the Milky Ocean by the devas and asuras to get the nectar. The sacred Cauvery River flowing nearby herself has turned around in a right semicircle around this shrine and hence the name Valanchuli or right twist. Renovation of this temple at a cost of Rs. 50 Lakhs is progressing. Another architecturally beautiful temple at Kilpazhayarai dedicated to Lord Somanathaswami is also under renovtion at an estimated cost of Rs. 50 Lakhs. It is worth mentioning that this shring is the birthplace of Saint Managaiyarkarasi, one among the 63 Nayanmars. Hymns in praise of the presiding deity have been sung by Tirunavukkarasar. Other sub-temples mentioned below under the administrative control of Swamimalai temple are also to be renovated at a modest cost of about Rs. 5 lakhs each. 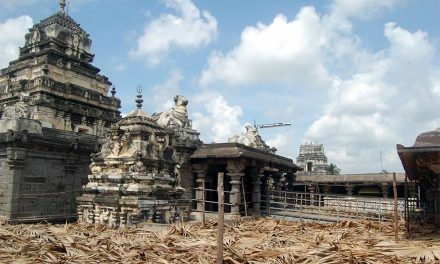 All the above temples along with the Swamimalai temple are administered by an Asst. Commissioner / Executive Officer appointed by the Commissioner, Hindu Religious and Charitable Endowments Dept, Chennai.